Buffelgrass is a perennial grass from Africa that is invasive to the Sonoran Desert of the Southwest United States, where it threatens desert ecosystems by out-competing native plants and altering fire regimes. It has the potential to transform the Sonoran Desert ecosystem from a diverse assemblage of plants to a grassland monoculture. Buffelgrass was brought to Arizona in the 1930s for erosion control and began expanding rapidly in the 1980s. Left unchecked, buffelgrass will dominate the desert landscape and could cause regular, fast-moving wildfires. USGS research shows that early treatment of areas invaded by buffelgrass can dramatically reduce the presence of this species. 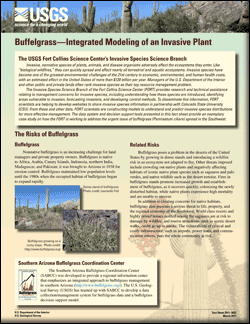 Buffelgrass-Integrated modeling of an invasive plant; 2011; FS; 2011-3022; Holcombe, Tracy R.
Dense stand of the invasive grass buffelgrass choking out native vegetation in Saguaro National Park, Arizona. Figure 2.Map showing the locations of the citizen science buffelgrass observation sites in Tucson, Arizona, and the outlined polygons of buffelgrass patches in Saguaro National Park East and West. Buffelgrass density is coded as High (H); Medium (M); Low (L) and Trace (T).